Take a look at the past guest reviews about this great condo and you will quickly see why guests return year after year. If you are looking for a high quality well appointed and clean condo you have found it. This condominium is as close to parking, pool, boardwalk, and beach as you can get. Upscale ground floor unit eliminates the need to use an elevator and/or steps to access the condo. No need to use the elevator or walk through the lobby/hallways to get to the pool, boardwalk, and beach. Walk off of the patio and be at the pool and boardwalk to beach in just seconds. Beautiful landscape and sand dune view from condo. New high quality queen sleeper sofa and chairs in living room and new dining table and chairs (6). Several other major improvements were completed during the past two years including new GE stainless steel kitchen appliances - refrigerator, over the range microwave, dishwasher, range/stove. At the same time the condo was repainted, renovated, and redecorated. Those improvements followed several other enhancements in the past three years including a new entertainment center in living room with 46' LED HD Toshiba TV, new sofa end tables/coffee table, and a new patio dining set that seats six. To top it off a new full size front load washer and dryer were installed as well as installation of new granite kitchen countertops. This condo is perfect for families with children and those looking for easy and quick access to the pool and beach - just 110' feet from the patio to the pool and boardwalk. . Free wireless internet service is available for guest use. 1,250 square foot unit is located on the ground floor of Beachside One. The great location provides privacy with beautiful landscape and dune from the living room, master bedroom, and oversized patio. Unlike most rental units you will not find rental package furniture in this condo. Sandestin is a 2,400 acre paradise that has all the amenities that anyone could imagine. Renting this condominium directly from the owner will save you 35% to 40% versus making your reservations through the resort. Beachside One is a private gated condominium building, the smallest gulf-front building in Sandestin. The quality and convenience of the unit, coupled with the beauty and amenities of Sandestin, make it a great place to spend your vacation and leisure time. Great shopping and dining opportunities just minutes away at Sandestin's Baytowne Wharf, Destin Commons, and Silver Sands Outlet Mall - the largest designer factory outlet mall in Florida. 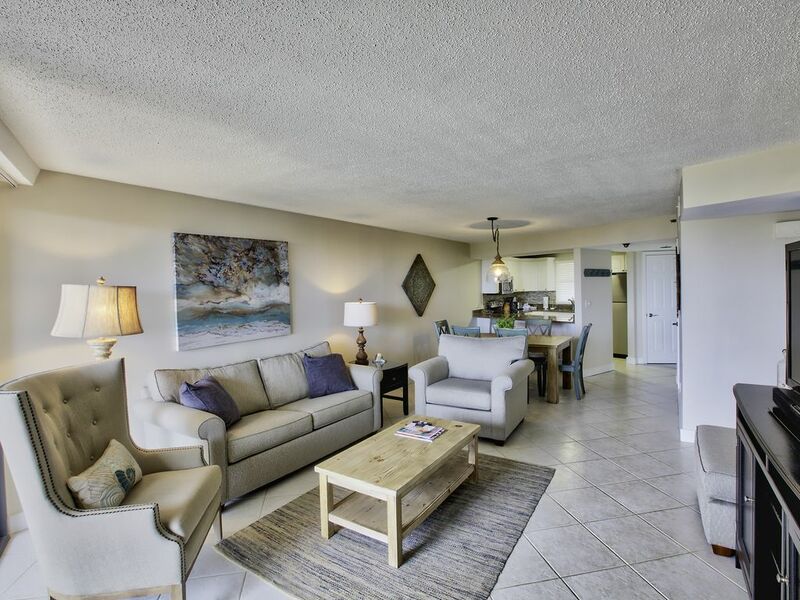 Spend your well deserved vacation and leisure time in a beautiful condominium just steps from the pool and the sugar white sand beaches of Sandestin Golf and Beach Resort. Please note that this unit is a non-smoking, no pet unit. Unless approved in advance and noted in the rental agreement the maximum occupancy is six. Beachside One does not allow guests to bring pets and the owner and association strictly enforce the no pet rule/policy. Fines and eviction will apply. Living room - queen sleeper sofa, new 46' LED HD TV with DVD. Sandestin Golf & Beach Resort is the finest resort development in the Panhandle and northwest Florida. Great resort, great gulf front high quality condominium a stones throw from the beautiful white sand beach of Sandestin. Great location! Doesn’t have ocean view due to the dunes but the convenience of the 1st floor out weighs that!! Very close to pool beach had a great stay there. Gary is very helpful if you have any questions. Would definitely stay in this condo again! We had a great stay in October. The weather was warm and staying in the ground level condo was very convenient to beach and pool. The condo was clean and had everything we needed. The resort area is enormous. We used Gary’s golf cart which was super fun to buzz around in and were able to do everything within the resort property... go out to dinner, get ice cream, go to a movie, grocery shop, and shop at both established stores and tourist shops. We had a fantastic time and would choose the condo and renting from Gary again! He was a great host!! Unit was exactly as described. Very convenient access to pool and beach. We're already planning a return visit! The property was excellent, ground floor was very nice not having to wait on the elevator. Beach was beautiful, pool was great, and we could ride the golf cart to shopping, restaurants, and the grocery store. We would definitely book this property again. When we arrived, the condo was just as advertised. Clean, comfortable, and looked just like the pictures. The beach is beautiful, with white sand and clear blue/green water. One of the prettiest & cleanest beaches we have seen. Out your front door, you are steps to the gated parking lot. Out the back is a large porch, view of the sand dunes with a nice grassy area. You take a left and you’re at the pool in a matter of seconds. The beach is up a set of stairs and down a short walkway past the pool. The golf cart proved to be as popular as the beach! Beachside One sets on a 2,400 acre private gated community. We took the back way to Publix for groceries, and over to the Marina and Baytowne Wharf. The Village of Baytowne has restaurants, ice cream, shopping & plenty for kids. Spoke to Gary when we arrived, and he was a super nice guy! I would recommend this condo to anyone. If there is any downside, it’s that you can’t really see the beach/water from your condo because of the dunes. But it’s a trade off, to walk out your back door and skip the elevator! This Beachside 1 Condo was fantastic for our week long vacation. In the past we have have always opted for the higher floors in the complex but there are some wonderful advantages to being on ground level. In and out in seconds to the pool, the beach, no hauling stuff up and down the elevators or the stairs. The owners Gary and Debbie are great to work with and have a well appointed unit with everything you could possibly need for a perfect vacation! I would rent this unit again and again and again! Sandestin Golf & Beach Resort is the # 1 resort in the Florida Panhandle. In addition to a quality resort environment you are within minutes of the largest designer outlet mall in Florida and other fabulous shopping opportunities. Visit the beautiful Destin Commons shopping area and many others in the immediate area. From Baytowne Wharf to throughout the area restaurants of every type are available within the resort and within minutes of the resort. Deposit is non-refundable. If final payment is not received by the due date stated in the agreement the owner reserves the right to cancel the reservation with no refund of deposit. Note that the Beachside One condominium building does not allow guests to bring pets other than long term rentals from Dec 1 to Feb 28.